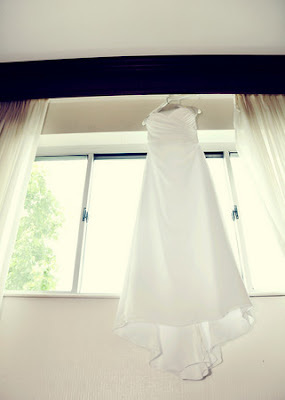 Recently, a friend of a friend commented on Facebook about wanting to get her wedding dress preserved. It wasn't a stupid or ridiculous thought. In fact, I'm pretty sure most women get their wedding dress preserved. This coming from the girl who has been married 11 months and that stupid dress is still hanging from my closet door. And it aggravates me every single day. So, why haven't I just taken it to the cleaners to get it cleaned and preserved like every other good bride? Well, actually, I did take it once. Until I found out that it was going to cost me almost as much as I paid for the dress. The frugal Duggar-mindset kicked in and I picked it back up from the cleaners before they could do anything with it. I immediately listed it on Craigslist, hoping to get $100 or so from the sale. I never had much interest or feedback. I'm pretty sure a used wedding gown isn't something many people are searching for. The fact that I cannot close my closet door, due to the hanger from the dress over the top, is an every day annoyance. Yet, I haven't been able to just break down and get rid of it. I'm not typically over-sentimental about these types of things, so it annoys me that I've not been able to take that next step. But at the same time, I've not been rushing out to spend a ridiculous amount of money to preserve something that has no need for preserving. What am I ever going to do with that dress again in my lifetime? My future daughter will not want to wear it. And I've given up the thought of having christening gowns for my unconceived children made from the material. That's just too much effort. Not to mention the fact that I literally have no where in my entire house to store it, if it were to be boxed up. Unless the attic counts. And I'm pretty sure that defeats the purpose. I would love to be able to find someplace, other than Goodwill, where I could donate it and know that it's going to a good home. I would love for it to go to someone that could honestly use it and appreciate the fact that I gave it up for them to be able to wear. I'm just not sure where to find that kind of place. And I'm just not 100% sure I'm ready to let it go. Oh... that stupid pushing and pulling from society that dictates I should be emotionally attached to a stupid piece of fabric! It just pisses me off! I've got a gazillion photos of me wearing the thing and those will last much longer, and be much more easily shared & enjoyed, than the stupid dress taking up space in The Bungalow's tiny 1940s era closet. I'm going to make a promise to myself that by the end of the summer, the dress will have found a new home. Either I will break down and pay to have it cleaned & boxed or I will donate it or sell it. I do think if I donate it, I will keep the brooches off the halter top. Those are really the only detail to the dress anyway, and it would be neat to keep those. If I got uber-sentimental down the road, I could have them made into a pin or some hair clips or something. Props to you brides who want to keep your extravagant dresses. If you spent thousands of dollars on the dress, I can see the mentality behind keeping it. I decided the dress was about the least important part of the day (behind flowers, a rehersal dinner, and other trivial stupid things brides freak out about) so I spent as little as possible on it. Probably, in the back of my head, knowing that it would be something I wouldn't hang on to for long. So, if anyone knows of someone who can use a used dress (worn only once!) or of an organization that would accept the donation, please let me know. Until then... I'm going to spend that preservation money on a weekend vacation. That's money much wiser spent in our world. You can donate your dress to the Mary Madeline project. (marymadelineproject.org) They will take your dress and create baptismal and burial gowns for premies and stillborn babies. Also, the donation is tax deductible. You just have to pack it up and ship it to them.